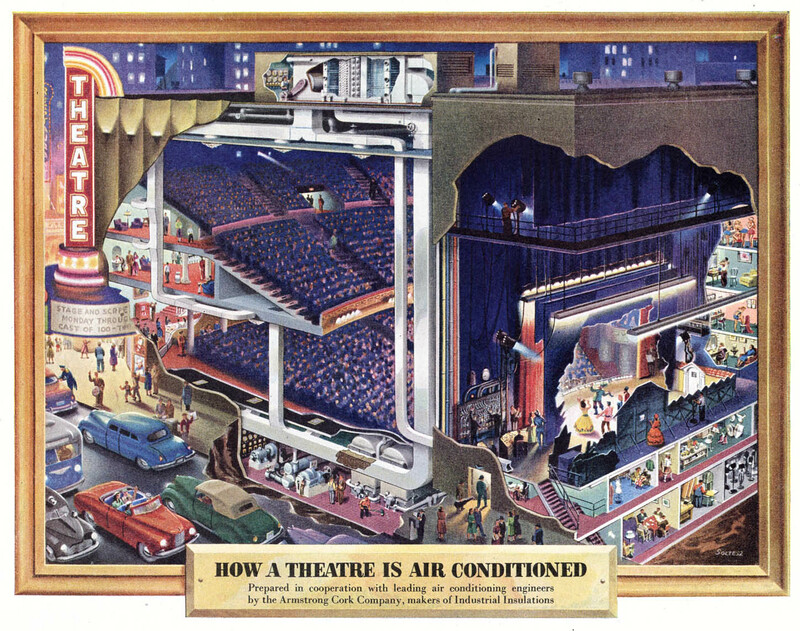 We love looking at vintage infographics, in particular cutaways and cross-sections (we are in fact working a book about them, we’ll keep you posted very soon!) One of the gems we have found lately is the work of Frank Soltesz. 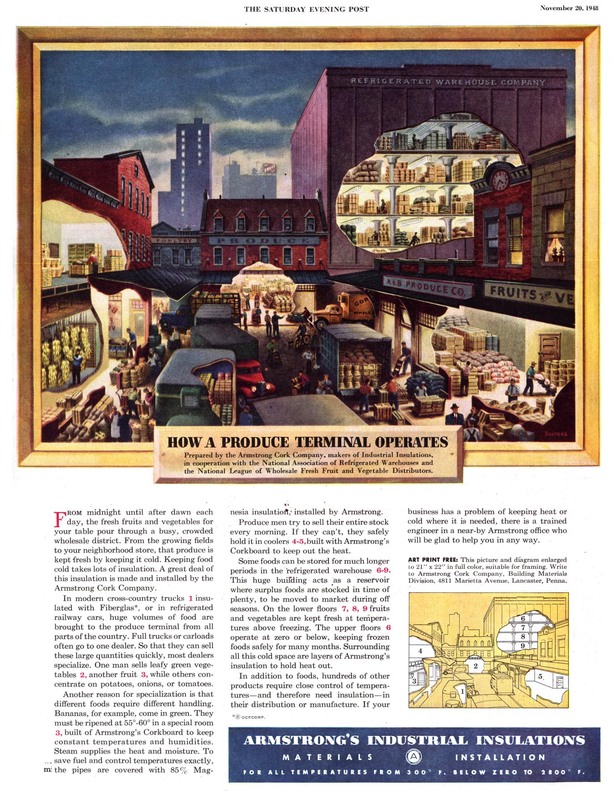 Born in Pennsylvania in 1912 and active from the 30’s to the 60’s, Soltesz was a versatile commercial illustrator who had a love for large cutaways. He spent part of his career working for the BBD&O advertising company. 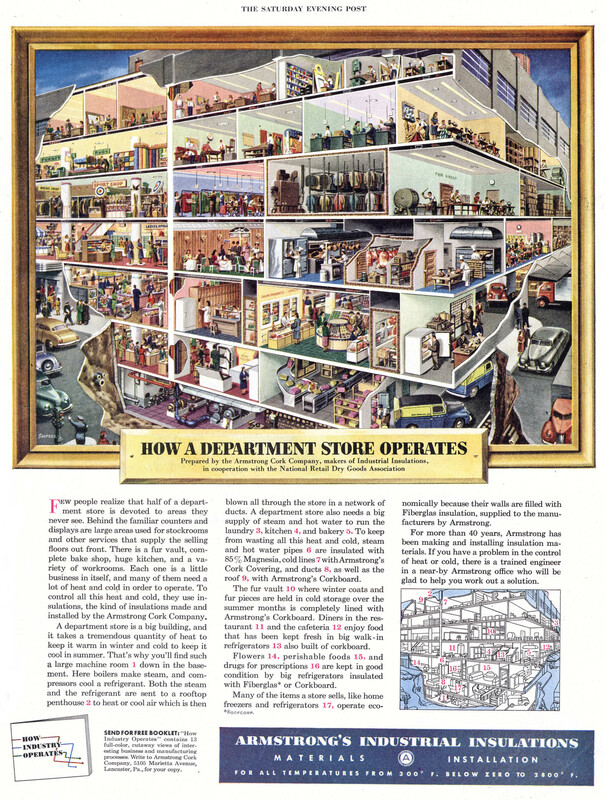 Among his best work is a series of 29 advertising cross-sections published between 1947 and 1951 to show how the Armstrong Cork Co. company’s products were utilized. We show some of them here. 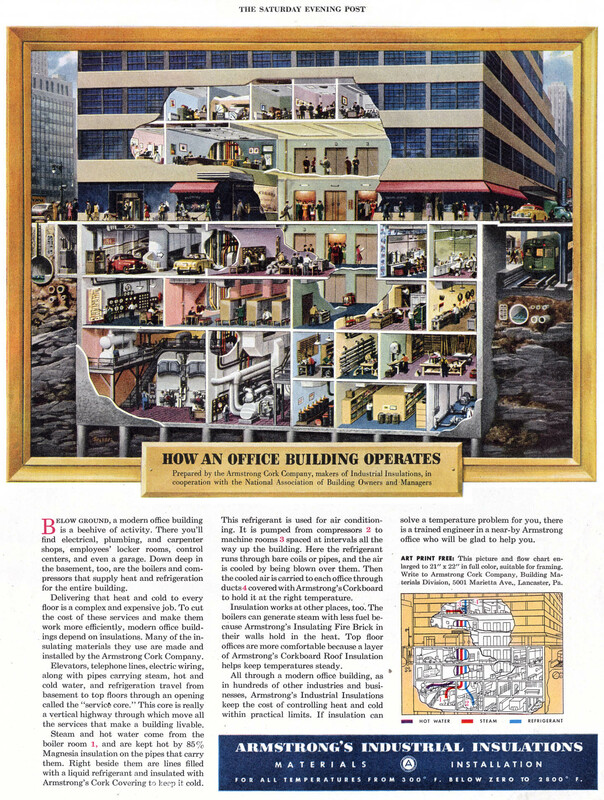 These illustrations appeared in the Saturday Evening Post and show lavishly detailed images of buildings and factories with their walls partially removed. The more you look at the scenes and the tiny human figures as they move about, the more engaging they become. 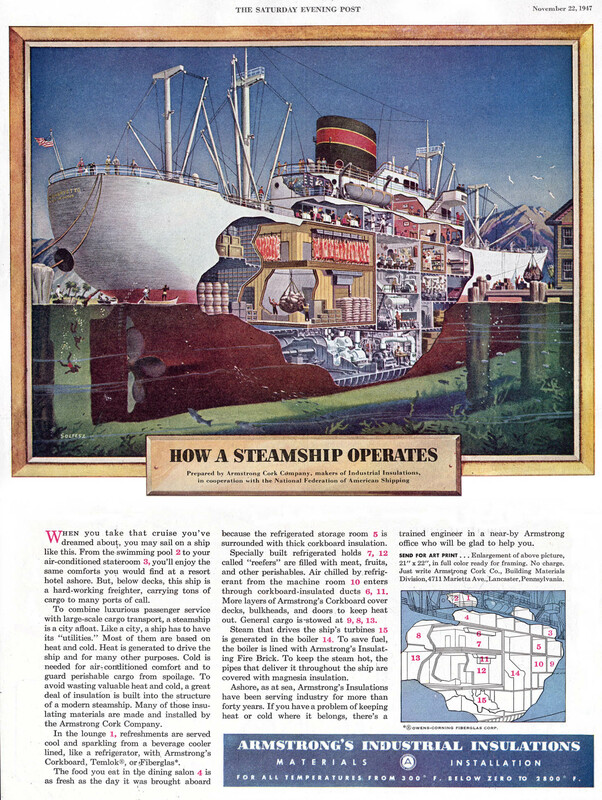 Each illustration has an inset with the key. They had a drawn frame and title and readers could request 21 by 22 inch copy suitable for framing or even a free booklet with some of the illustrations. There is remarkable lack of biographical detail about Soltesz. He was a member of the American Watercolor Society as late as 1981. 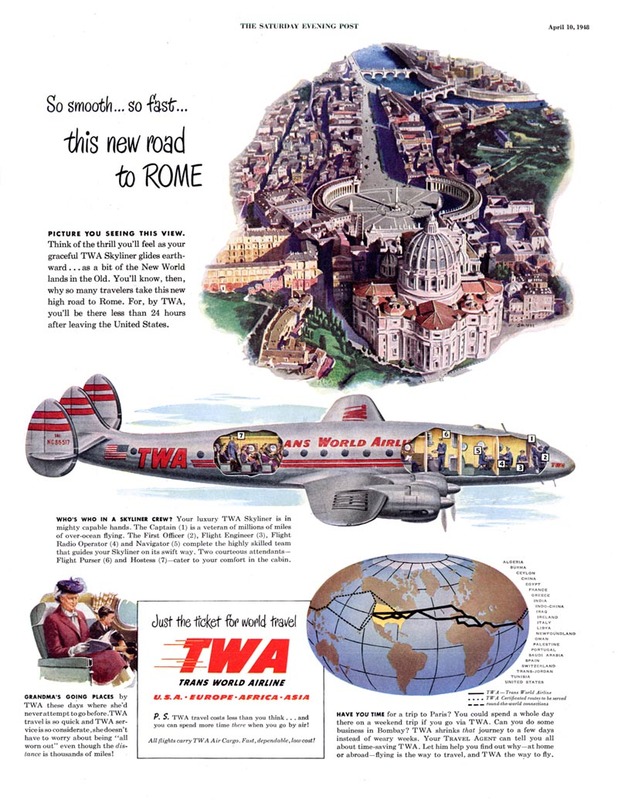 In addition to his commercial work for Armstrong Cork Co., Soltesz worked with accounts of other companies such as TWA (an example below), General Electric, General Motors, Goodyear Tire and Rubber, etc. 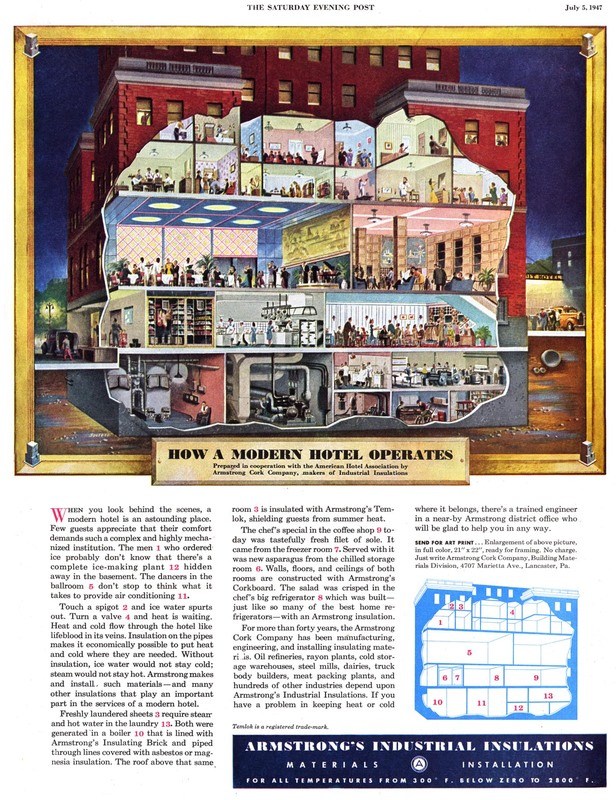 Apart from the Saturday Evening Post, his work appeared in many of the great periodicals of his time like Life, Colliers, Esquire, Sports Illustrated, Forbes, Fortune, Time, Business Week, U.S. News and World Report. This entry was posted in Graphics, Uncategorized by 5wgraphicsblog. Bookmark the permalink.